Most of the articles we write here give positive views of people who use YouTube, and we highlight some of the fantastic videos that people upload every day. Many businesses have built excellent relationships with YouTubers, and there are now many successful, motivated and trustworthy influencers on the platform. However, as with everywhere, there are a small minority of people on YouTube who operate their channels using questionable ethical practices. On the surface, Fantastic Adventures (no longer online) seemed like a fun channel for kids. It featured a series of videos of a family of children who fought super-villains and evil babysitters. But in real life, the children were not as happy and prosperous as their onscreen alter egos. The channel was operated by the children’s adoptive mother, Machelle Hackney, 48, who Arizona law enforcement has accused of mistreating the children. The accusations include pepper-spraying the children from head to toe, making them take ice baths (pushing their heads under the water), locking them in cupboards, and denying them necessary food and drink for long periods. Hackney has been charged with two counts of child molestation, five counts of child neglect, five counts of unlawful imprisonment, and seven counts of child abuse. Her two adult (biological) sons have been charged with failing to report the abuse. It was her biological daughter, Megan, who contacted police, concerned about the activity in the house. Amongst the allegations, the children reported that they were forced to participate in the YouTube videos. They were punished if they refused to appear in a scene or forgot their lines. Hackney clearly took her YouTube seriously and required all the participants to perform at their best, whether they wanted to or not. YouTube initially responded quickly to the allegations. They demonetized the channel as soon as they heard of the arrests. They have subsequently terminated and taken down the channel, although they have come under fire for the delay in taking the channel down. Despite the channel no longer existing, SocialBook can still access much of its data. It is clear, that it was a lucrative cash earner for Hackney, although obviously not for the kids themselves. The channel had over 800,000 subscribers and had racked up more than 250 million views over its 6.5-year life. Its subscribers were highly engaged, as it had an Average Views to Subscriber ratio of 732.92%, meaning that its subscribers watched each video, on average seven times. The average ratio for a YouTube channel is only 14%, so this indicates that Fantastic Adventure’s followers clearly liked the kids’ video antics. The channel received its 800,000th subscriber just hours before YouTube closed it down. The videos ranged from a low of 202.9K views up to one highly popular video seen 29.0M times. The last ten videos averaged 2.6M views. Sponsored posts had noticeably fewer viewers than organic videos. However, they still performed well. 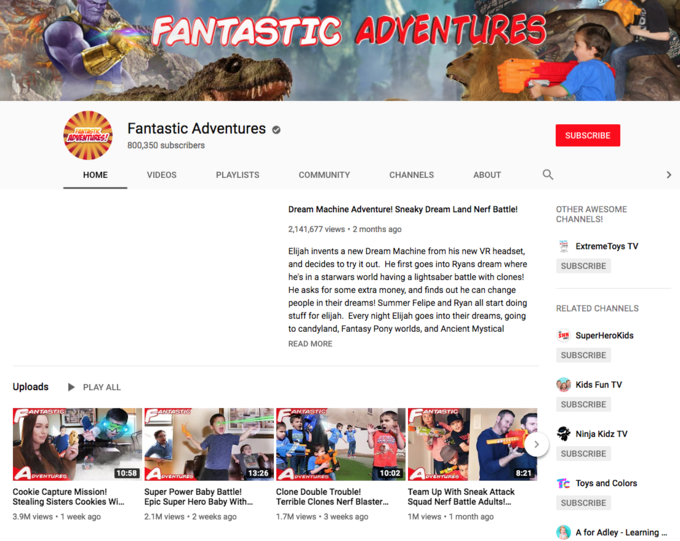 On average, 2.0M people watched Fantastic Adventures’ sponsored posts, compared to 3.8M for their organic videos. SocialBook calculates that Fantastic Adventures could have charged between $3,705 and $9,111 per video based on their channel’s historical performance & subscriber behavior. Based on these figures we calculate the cost per 1000 views on the channel to be between $1.83 and $4.50. If Hackney’s most popular video was monetized, we can calculate that it would have earned her between $53,070 and $130,500. While we cannot calculate the total amount that the channel earned over its entire life, it is clear that Fantastic Adventures was a good earner for Hackney. She clearly felt that her adopted kids needed to continue to perform as actors to keep the money flowing into her bank account. Technically, YouTube expects its creators to be at least thirteen before they create a channel. This is mainly because Google (YouTube’s parent company) collects and markets user data, and the Children’s Online Privacy Protection Act (COPPA) exempts kids from data collection. Yet there are many YouTube channels run by younger children, as well as channels like Fantastic Adventures that are technically run by adults but feature children in their videos. The whole concept of working with child influencers has been the topic of much discussion lately. Brands certainly need to be careful when working with channels featuring child presenters and “actors.” This doesn’t mean that they must avoid it, however. Many child-centric channels rely on monetization to exist and certainly don’t have to mistreat their youthful participants. Influencer marketing is increasing in popularity across all sectors and ages. It should be no surprise that more brands want to engage online with children and their families. They just want to be sure that they don’t become associated with unethical influencers, such as Hackney. 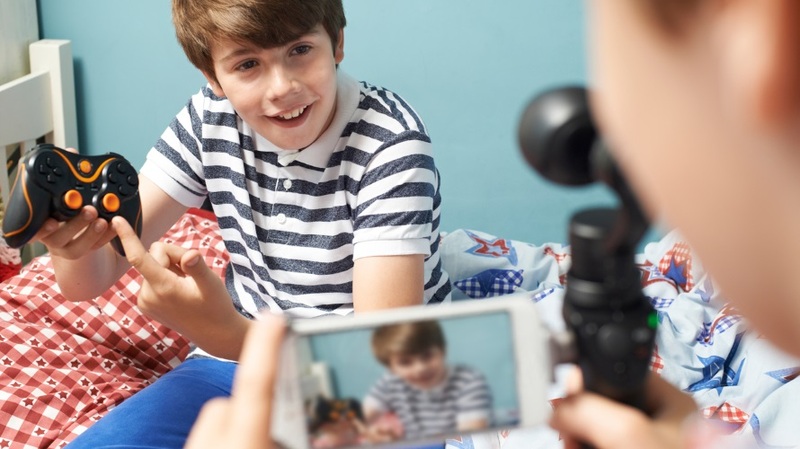 The number 1 earner on YouTube in 2018 was a 7-year-old boy called Ryan, who enjoys reviewing toys for his fellow kid-fans. After making a highly respectable $11M in 2017, he doubled his efforts last year, to take in $22M in income. Ryan is clearly a very willing participant in his channel and would be very upset (and substantially poorer) if there was an overreaction to the Fantastic Adventures horrors. Ryan (his last known has not yet been publicized) began making video toy reviews at the incredibly young age of four. According to his parents, he was inspired by the videos other kids uploaded to YouTube and wanted to make his own. Some parents complain that Ryan (and other similar channels) have too much influence. If Ryan gives a good review for a toy, thousands of kids go racing to their moms wanting that toy. Parents feel pressured by their kids as a result of watching Ryan’s reviews. Help children become informed consumers. Although authenticity is key to all influencer marketing success, it is more important than ever when creating content aimed at kids. Brands need to ensure everything they do, when targeting kids, is transparent and honest. Any videos including paid promotion need to have #spon or #ad attached to them. Any videos must be entirely age-appropriate for the intended audience. This is particularly important if you’re targeting Under 13s, as it first needs to meet parental approval. Many children begin watching YouTube videos from as young as two. Indeed, quite a few watch YouTube in place of traditional television. Younger kids particularly like the unboxing-type videos favored by Ryan. However, they also love the comedy-type videos featured on Fantastic Adventures. That would be one of the reasons that that website had such a high Average Viewers to Subscriber ratio. What kids really like watching in their videos, however, is other kids. Traditional voice-over toy ads are unlikely to be as loved by Generation Alpha on YouTube as videos showing kids playing with their toys. The Fantastic Adventures situation is somewhat unusual. On the surface, the channel appeared totally above board and normal. None of its videos caused any concerns, and they didn’t result in any complaints. The kids in the videos looked happy, making videos just like thousands of others. They engaged in Nerf battles, trick shot battles, comedy sketches, and other child-friendly activities. As the channel didn’t create any red flags, YouTube happily monetized the channel, and brands let their ads play on the kids’ videos without concern. The advertisers can’t be faulted for this, as the allegations came from nowhere. Even those brands who had done due diligence would have had no issues with the channel before the complaints. The problems were all behind the scenes. However, once the horror allegedly inflicted on the kids by Hackney was revealed, YouTube could probably have reacted quicker. Sure, they removed monetization, taking away Hackney’s cash flow and stopping embarrassment to advertisers, but they kept the channel online for a while longer. They only closed the channel after a groundswell of dissatisfaction. While this must be balanced against the assumption of the legal system that you are innocent until proven guilty, the accusation that the child actors were not always willing to perform, means that YouTube could have acted quicker. In the meantime, the adopted children aged to 6 to 15, have been removed from the home. Here is a separate blog explaining the accuracy of our algorithm in case you are interested.